To sustain its free social-impact event-programs AlligatorZone® has started piloting specially designed after-school enrichment programs in select schools. At AlligatorZone® Afterschool, students gain an understanding of the real-world relevance of subjects taught in schools, coding clubs and robotics camps, through activities drawn from entrepreneurial problem-solving. Register through your school’s PTA using the following links. MacFarlane Park Elementary IB School, Tampa Bay FL. 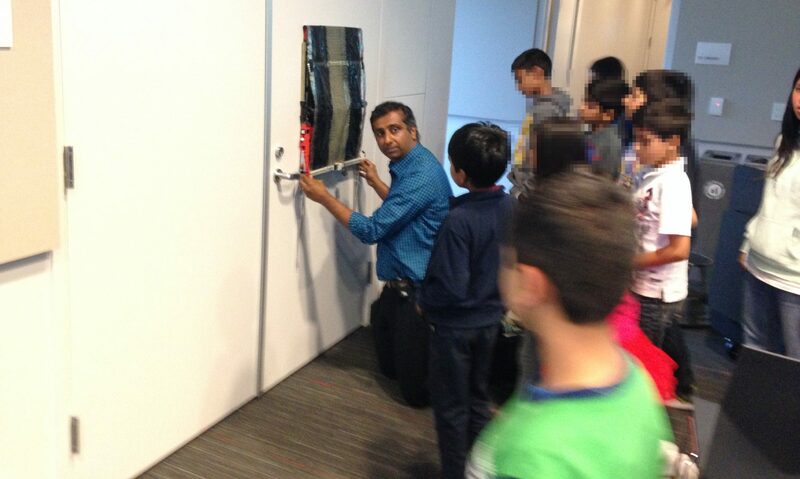 (Check for the tuition payment is to be made in the name of SiliconGlades and brought in on the first day of attendance in the after-school club). Roland Park K-8 Magnet IB School, Tampa Bay FL. Please follow the steps in the school’s registration process, regarding payment of tuition for the after-school club. To bring this after-school club to your campus, please ask your PTA to contact us using this form. 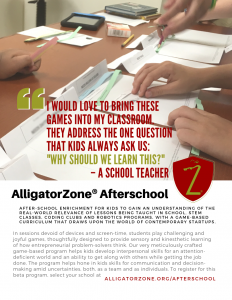 AlligatorZone® Afterschool program brings enrichment through complex games of skill and strategy drawn from the world of entrepreneurship and innovation. In sessions devoid of devices and screen-time, students will play challenging and joyful games designed to provide opportunities to enjoy sensory experiences for kinesthetic learning. The very meticulously designed game-based program helps kids develop interpersonal skills for an attention-deficient world, an ability to get along with others while getting the job done, hones decision-making skills in teams and as individuals and helps them build coping mechanisms to manage uncertainties, by developing an entrepreneurial mindset. AlligatorZone Afterschool is in beta hence, marked β. 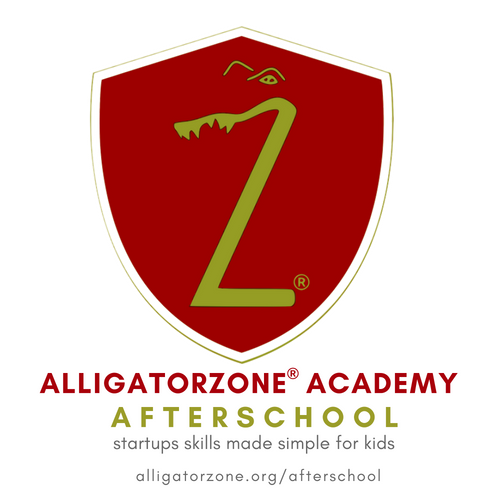 About AlligatorZone®: AlligatorZone®, where kids meet cool startups™, is a nationwide face-to-face educational community platform that brings together entrepreneurs and school-age kids to help the youngsters get a peek into the minds of those who are creating the future. AlligatorZone® offers event-programs, alternative learning environments and educational enrichment programs for children, in a shared experience with a parent or a guardian. The mission of AlligatorZone® is to help families and educators prepare their kids for careers that do not yet exist, in our fast-changing world.